Dobroměřice is a village and municipality (obec) in Louny District in the Ústí nad Labem Region of the Czech Republic. The municipality covers an area of 4.76 square kilometres (1.84 sq mi), and has a population of 1,369 (as at 28 August 2006). Dobroměřice lies approximately 3 kilometres (2 mi) north of Louny, 37 km (23 mi) southwest of Ústí nad Labem, and 56 km (35 mi) northwest of Prague. Wikimedia Commons has media related to Dobroměřice. 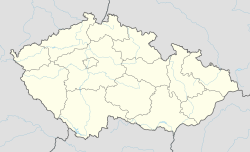 This Ústí nad Labem Region location article is a stub. You can help Wikipedia by expanding it. This page was last edited on 5 November 2017, at 16:08 (UTC).